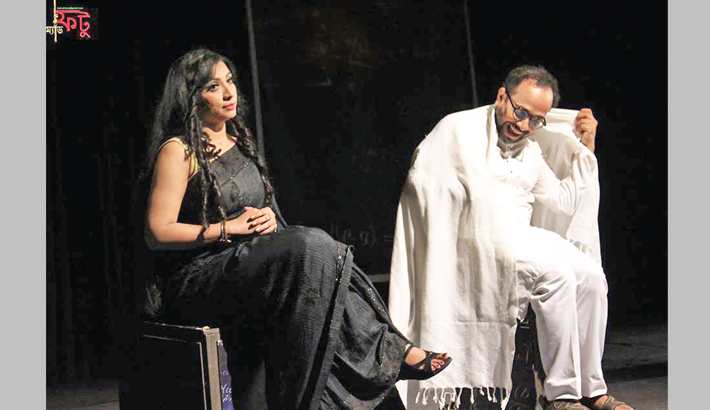 Theatre troupe Mad Theatre will stage yet another show of their maiden play ‘Naddiyo Natim’ at the Studio Theatre Main Hall of Bangladesh Shilpakala Academy in the city on Wednesday evening. Naddiyo Natim was five successful shows in Guwahati, India and London, UK last month. Directed by Asadul Islam, the play has been produced based on the novel of Humayun Ahmed’s ‘Ke Kotha Koy’. Naddiyo Natim is a main character of this novel. Matin Uddin is an Uzbek poet. He reversed the spelling of his name Naddiyo Natim. He got acquainted with Komal during his tuition. Meghdut plays the role of Komal. Muna is Komals mother, played by Subarna. Physically-disabled Komal revealed a secret of her life to Matin, who jumped off the roof to protect Meghduts secret. Interestingly, all three actors in the play Asadul Islam, his wife Sonia Hasan Subarna, and their daughter Meghdut -are from the same family. Naddiyo Natim the play which is the 36th production of the theatre troupe. To note, Mad Theatre started their journey to the theatre arena on October in 2015 by staging the play ‘Naddiyo Natim’.